Many of the accident injury patients who visit our office suffer from spinal and neck injuries, such as whiplash. When whiplash occurs, it causes the discs and vertebrae in the neck to lose their natural alignment, which may result in compression and nerve irritation. Although whiplash symptoms are not always apparent at first, stiff muscles and soreness may start in the days immediately following an accident. Left untreated, whiplash can progress into a more uncomfortable condition that becomes increasingly difficult to treat with time. When we first meet with an auto accident injury patient, we conduct a comprehensive examination upon making a diagnosis. We construct a customized treatment plan designed to relieve neck pain and back pain, promote healing and prevent future injuries and complications. Depending on the nature and location of the injury, we typically use gentle, but firm pressure to manipulate the spine into a more natural alignment. Although healing occurs over the course of many weeks or months, the muscles and joints in the spine are often able to return to healthy, normal function with regular treatments. Neck pain is the single most common complaint reported by our patients who have experienced whiplash trauma. Often the pain radiates across the shoulders, up into the head, and down between the shoulder blades. Whiplash injuries tend to affect all of the tissues in the neck, including the facet joints and discs between the vertebrae, as well as all of the muscles, ligaments and nerves. Disc injury is also a common cause of neck pain, especially chronic pain. The outer wall of the disc can be torn or severely damaged during a whiplash trauma. A less common, but very debilitating disorder that results from whiplash is temporomandibular joint dysfunction (TMJ). TMJ usually begins as pain along with clicking and popping noises in the jaw during movement. 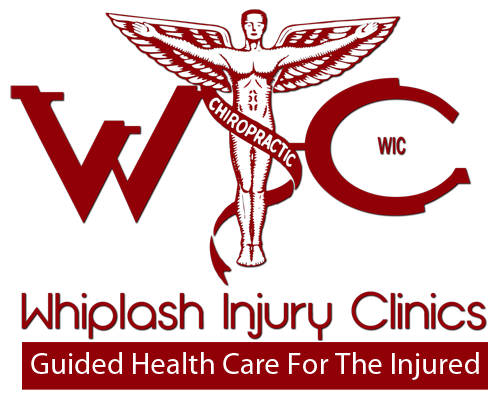 Our chiropractor groups at Whiplash Injury Clinics are specially trained to treat TMJ problems. If we think you need additional care, we can refer you to a specialist. The most common injury to the neck is a whiplash injury. Whiplash is caused by a sudden movement of the head, backward, forward, or sideways, that results in the damage to the supporting muscles, ligaments and other connective tissues in the neck and upper back. One of the most common causes of neck pain, and sometimes headaches, is poor posture. It’s easy to get into bad posture habits without even realizing it – even an activity as “innocent” as reading in bed can ultimately lead to pain, headaches, and more serious problems. The basic rule is simple: keep your neck in a “neutral” position whenever possible. Don’t bend or hunch your neck forward for long periods. Also, try not to sit in one position for a long time. areas: the top of the cervical spine where it meets the skull; in the middle of the cervical spine where the mechanical stress from the head is the greatest; in the transition where the cervical and thoracic areas of the spine meet; and in the middle of the thoracic spine where the mechanical stress from the weight of the upper body is greatest. Signs of subluxation include looking in the mirror and seeing your head tilted or one shoulder higher than the other. Often, women will notice that their sleeve length is different or that a necklace is hanging off center. If someone looks at you from the side they may notice that your head sits forward from your shoulders. When most people become stressed they unconsciously contract their muscles. In particular the muscles in their back. This ‘muscle guarding’ is a survival response designed to guard against injury. In today’s world where we are not exposed to physical danger most of the time, muscle guarding still occurs whenever we become emotionally stressed. The areas most affected are the muscles of the neck, upper back and low back. For most of us, the particular muscle affected by stress is the trapezius muscle, where daily stress usually leads to chronic tightness and the development of trigger points. The discs in your cervical spine can herniate or bulge and put pressure on the nerves that exit from the spine through that area. Although cervical discs do not herniate nearly as often as lumbar discs do, they occasionally can herniate, especially when the discs sustain damage from a whiplash injury. Contrary to popular belief, a herniated disc does not automatically mean that you are going to suffer from lower back pain. In fact, one study found that almost half of all adults had at least one bulging or herniated disc, even though they did not suffer any back pain from it. On the other hand, herniated discs can be a source of intense and debilitating pain that frequently radiates to other areas of the body. Unfortunately, once a disc herniates, they rarely, if ever, completely heal. Further deterioration can often be avoided through regular chiropractic care, but a complete recovery is much less common.